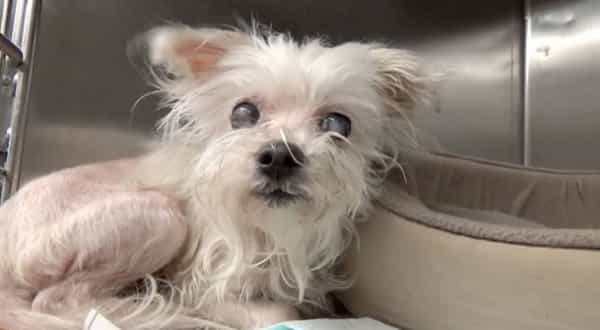 Sweet DIAMOND is partially blind and so lost and confused after she was left at the Shelter. She is a sweet angel and she needs help NOW! Please SHARE, she's SO precious She need a FOSTER or ADOPTER NOW. #A3661625 My name is DIAMOND and I'm an approximately 10 year old female Maltese. I am not yet spayed. I have been at the Carson Animal Care Center since 1/18. I will be available on 1/18. You can visit me at my temporary home at C403. My former family who owned me for had to give me up because they couldn't afford the care I need. 2 Responses to "Jerk owner surrender blind senior Diamond, so lost and confused after she was left at the Shelter"
Please share for this senior baby!!!!! Needs a home now! !